You like mohinga?” asked Min Naing as we partook of the quintessential Burmese dish in a bustling tea shop, the center of Burmese social life. It has become our tradition whenever I visit Rangoon to meet in this tea shop and discuss various issues—from food and music to global warming and contemporary American politics—over steaming cups of Burmese tea and bowls of noodles. 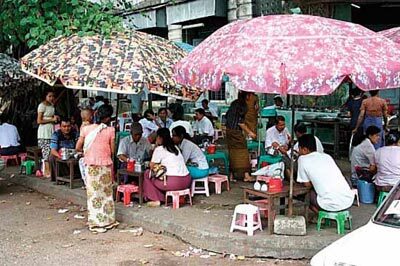 Tea shops are centers of Burmese culinary culture. I nodded. Few people I know could turn down a bowl of mohinga, the piquant, complex medley of rice noodles and other ingredients in a savory fish-based broth widely regarded as the country’s national dish. Although it is considered a breakfast food, you can usually get it at any time of day, in tea shops and restaurants or from street stalls—or even from roving vendors who gingerly balance bowls, noodles and a cauldron of broth on a shoulder pole. Min Naing beamed a broad smile as he authoritatively listed the main components of mohinga, ticking them off on his fingers: garlic, onions, chilies, lemongrass, turmeric, ginger, fish paste and banana tree stems. “What kind of fish do they usually use?” I asked. Min Naing chuckled, listing colloquial names, in Burmese, of different types of fish, again counting them on his fingers. He then looked up with a twinkle in his eye. “But it doesn’t even have to be fish,” he replied with a satisfied smile at my look of surprise. “When I worked for U Ne Win, I had to travel all over the country,” he said. “I got to try the mohinga from everywhere. My favorite is from my home, Monywa. We use bean powder and chicken. It is called ‘anya mohinga.’ You can find it sometimes around Mandalay and Pagan. “In Monywa, near my home village, there is no big river, only small streams, so the fish are small, and we use chicken instead. Elsewhere, like in Irrawaddy Division, they have a lot of fish, so they use that. Other places are also different. In Pegu, they put tomato in their mohinga.” He smiled wistfully at the memory. “I used to live and work in Arakan State. Arakan mohinga is very spicy,” he recalled. “When I went to eat it, I had to bring candy with me in my pocket to eat afterward!” He chuckled while patting his shirt pocket, as if to reassure himself the candies were still there. Not all of Burma’s mohingas suited his taste, though. “Tavoy mohinga is bland. I don’t like that one. A few years ago, a general who was originally from Tavoy came to open an exhibition here and they made Tavoy-style mohinga to please him. They seemed to like it, but it had no taste for me,” he said, grimacing. He paused briefly amid the background cacophony of the tea shop: the clash of dishes and buzz of conversation, punctuated by the smooching sound customers make to get attention from waiters. Min Naing’s ready smile dissolved into a look of regret, momentarily making him look all of his 60 years.